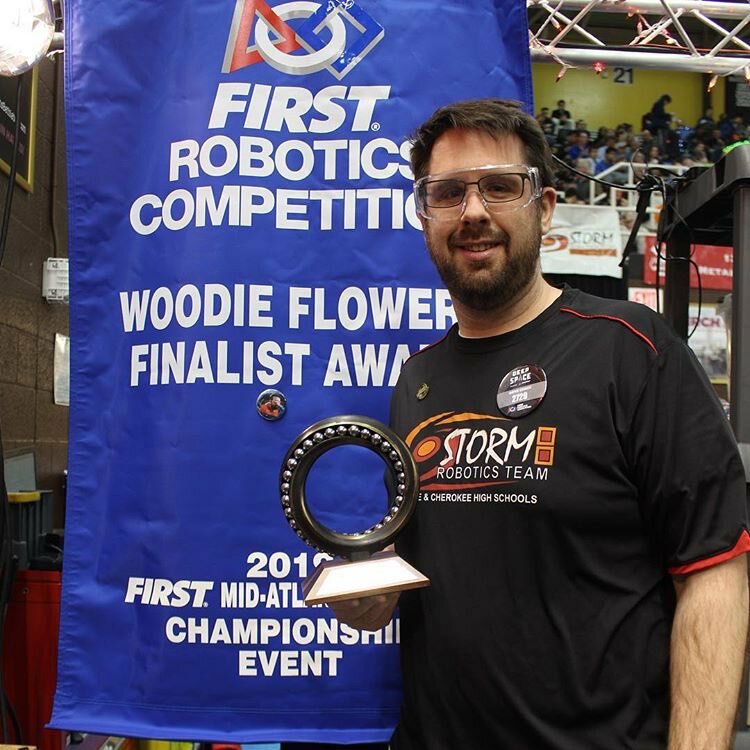 Cherokee High School and Lenape High School STORM Robotics advisor, Nathan Knauss, was recognized as the recipient of the FIRST Mid-Atlantic Region Woodie Flowers Award. Special to The Sun: Nathan Knauss, STORM Robotics Advisor for Cherokee High School and Lenape High School, stands with his FIRST Mid-Atlantic Region Woodie Flowers Award. Dr. William Murphy, a famed inventor of medical devices, founded this prestigious award in 1996 and named it after Woodie Flowers, a professor of mechanical engineering at the Massachusetts Institute of Technology, to bring attention to Flower’s eloquent and effective communication skills. The award is presented annually to only one outstanding mentor in the robotics competition. The recipient is selected by a group of judges where the criteria is looking for an outstanding, inspiring and motivational mentor leader. Student members of STORM’s team chose to nominate Knauss and submitted the online entry nomination form which included a “very moving” essay about their beloved advisor, mentor and teacher. They described “K-Bear”, as they affectionately nicknamed him, with creating a tight-knit STORM family where everyone has the opportunity to learn and grow. Officials said his friendly and efficient teaching style both inside and outside of the classroom assists students to find their own passion for robotics and even a potential career goal for some of its members. This “wonderful honor” has been a humbling experience for Knauss, as stated how grateful he is to have the opportunity to work with the students. Officials offer congratulations to Knauss for this “well-deserved” recognition and award.